Abhinav: Hi ! I’m Abhinav Gangwar, a final year student in Electronics and Communication branch at NIT Hamirpur. I love challenges as they help me explore my potential. I sometimes write poems too :D.
Abhinav: I got selected for GSoC 2014. GSoC is about getting universty students involved with open source development, providing students the opportunity to do work related to their academic pursuits (think, “flip bits, not burggers” 😀 ) and giving exposure to real world software development scenarios (e.g, distributed development, software liscensing questions, mailing-list etiquette). I worked for open source project Marble under KDE . Marble is virtual globe and world atlas. My project aim was to design an educational game to learn geography. The coding period for project was from May 19 to August 18. Place and duration choice is all yours – one of things I like the most about GSoC. I worked from home. We ( all Marble developers ) used to have a weekly status meeting on IRC on friday where we discussed about what was done in last week, what were the roadblocks and the futher ideas to work on – I love such discussions. And there was a nice pay for all this from Google – a stipend of $5500! Abhinav: I heard about GSoC in 4th semester but couldn’t do much about it at that time. So, I continued my pursuit in 6th semester. Keep yourself updated with http://www.google-melange.com/ . There is also a official google+ page which annouces all the related events. Abhinav: Student applications usually start in March (for exact dates go to melange website). In order to participate in the program, you must be a student. Google defines a student as an individual enrolled in or accepted into an accredited institution including (but not necessarily limited to) colleges, universities, masters programs, PhD programs and undergraduate programs. Go through “students and eligibilty” section in FAQs of GSoC on melange website for further details and updates. Abhinav: Students from all over the world participate apply for GSoC. So, you need to give yourself an edge from others. In GSoC 2014 out of 6313 proposals, 1307 proposals were selected. I got myself involved in Marble project in Feb 2014. I used to ask the developers to assign me tasks. Completing those tasks got me noticed by Marble developers and KDE. This surely provided me an edge from others. Further I also researched about the project idea and discussed it with developers – It helped me writing a good proposal. So, I think my proposal and the previous work I did, proved it to selectors that I could implement the project idea. Abhinav: I got the reply from google about my selection on Apr 22, 2014 at 12:19AM. Well, the celebrations were initiated by our so called BPL ceremony right after the selection news 😀 . After that there were parties. Abhinav : I started working on my project from very next morning after the result declaration, keeping in mind that I won’t be able to work in May due to final semester exams. So, I used to talk to my mentors and make some plans, broke them down to implementations details and kept working. We used to have weekly status meeting on IRC where we cleared any roadblocks with current plans and madee new plans. And kept working ! Abhinav :It’s better if computer games add values to your skill-set and be entertaining at the same time. So,I designed an educational game to learn geography. In the game I ask user questions like : to locate a country on globe, or identify the flag of a country etc. Please refer to my blog for project details. I’m still working on game to make it better. The final aim is to use this game in geography classes in academia for teaching purposes. 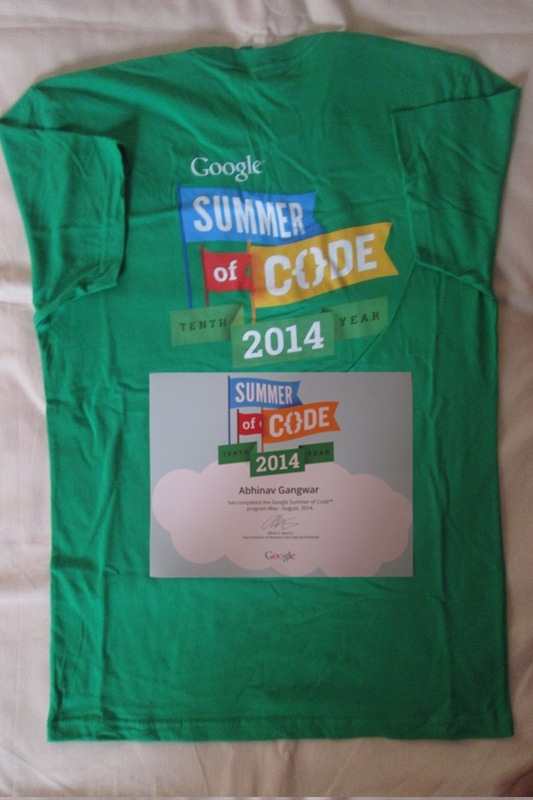 Abhinav :About GSoC, I very much liked that I was free to choose the place and time for working. Mentors were quite helpful and friendly. Getting guidance from such talented and experienced folks who are the original authors of the project , is simply awesome. I made some new friends 🙂 . I learned about cross platform framework qt and understood the large Marble’s codebase and its architecture was an interesting task in itself. Also, it got me involved with open source development and real world software projects. IF :Were there any special events during the internship? Abhinav :KDE organizes conferences and meetings where developers from all over the worlds come together. One of such events is the annual conference of KDE – Akademy. I missed it as I couldn’t get my passport on time. Abhinav :My mentor provided me all the required guidance from a high level overview to minor coding details. Administrators ensured that programs ran smoothly. IF : Let’s now talk about some negatives. What problems you or your friends faced, regards the internship, which your juniors may be able to avoid? Abhinav :I made some good friends during the internship period. Working with an open source organization for the first time was amazing for me. I liked the friendly and helpful nature of folks there. Abhinav : Yes, It was my first internship. Abhinav : I would like to thank my family and friends for their support in hard times. I express my profound gratitude to all Marble developers especially Torsten Rahn and Dennis Nienhüser for their friendly and helpful nature. And thanks to Google for organzing such a great program. Abhinav : This internship helped me in starting open source development. I learned how to work in a community where more than one developers are working on same project. And also it added lots of technical skills in me. Abhinav : Kee yourself updated to different opportunities through the internet. It is biggest boon, the internet, use it wisely. Always stay connected to your seniors. Also regarding GSoC, to suggest a strong proposal, you need to get involved with the organization beforehand. IF : What are your future plans after this internship and how much impact this internship will have on it? Abhinav : My GSoC project for designing an educational game is quite interesting. So, I’ll keep working on this project. Abhinav : You guys are doing great a job. It’s a nice initiative. It would help the students a lot to know the experience of other students.